Ohope Beach was voted NZ's best loved beach in 2014 and you will soon see why with its 11km stretch of white sand and the most sunshine hours of anywhere in NZ. The beach is long and flat with lots of hard sand at low tide for beach games, walking and cycling. Ohiwa Harbour is also well suited for kayaking, jet skiing, water skiing or SUP. There are plenty of places to walk, cycle or native bush hikes. If golf is your thing it has one of the top five links golf courses in NZ. Local attractions include a boat trip out to White Island to see an active volcano, fishing charters and dolphin watching. The area is something of a fruitbowl known for its blueberries and strawberries. The natural Awakeri hot springs are a popular destination. 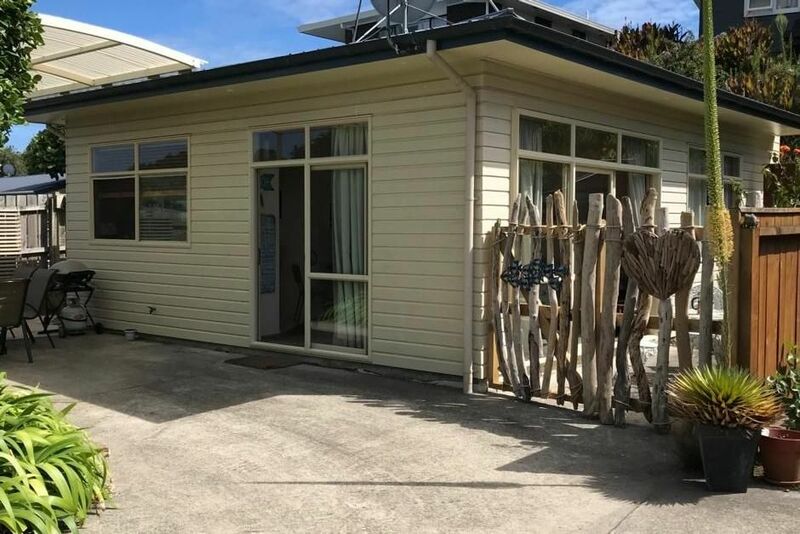 This cute 2 bedroom unit is all you need to experience the magic of Ohope Beach. It is well situated between the harbour and the sea enabling you to enjoy the great outdoors this summer. Enjoy fish and chips from the nearby Oyster Farm or a meal at Fisherman's Wharf Cafe at the port. Its a handy place to explore the east coast beaches and its only 10 minutes to the shops, cafes and entertainment of Whakatane. Property not fenced so may not be suitable for young children as close to the road. Neat and tidy Bach . Plenty of kitchen utensils. Easy walk to beach or harbour. Clean, tidy and super cute! Super cute! We enjoyed our stay here. It had everything we needed to be comfortable. Great location with just a short walk to the beach. We will definitely book this again! Good size two bedroom unit. The air conditioning was a comfort when we arrived to 33 degrees. Had everything we needed and quick to clean when it came time to leave. Very good location. The bach is very tidy and comfortable. It catered to our needs perfectly. Highly recommended. The location is great with being close to the beach. The location is great with being close to the beach. The Bach had everything we needed for the stay and was ideal for our family of four which included two teenagers. We thoroughly enjoyed staying there.